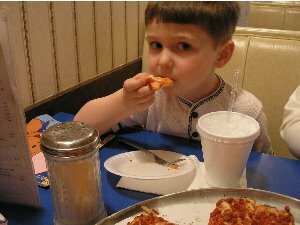 Here's Preston, my nephew enjoying his very first piece of a Greensboro classic... Pepperoni Pizza at Bill's Pizza Pub on High Point Road from earlier today. Preston has serious feelings about comic book superheroes. He loves Spider-Man, Batman, and the Justice League. He likes to dress up with different themes and play around the house all day. He’s learning to read some and I’m going to be his comic book pusher. I’ll have to get him started at Parts Unknown and Acme Comics here in Greensboro. He likes superheroes so that got me to thinking “reading is good”. But, I am a little concerned… Are comic books still approved by the Comics Code Authority? You know… That silent and shadowy organization that keeps filth and other contaminants out of the hands of our youth. You never hear them protesting about the things they don’t approve of. They will remain silent. You never hear anyone even mention their name. They are a very terrifying organization that keeps the minds of youths free and clear of overt violence and gratuitous sexuality. But, I have to look for that seal so that I’ll have peace of mind for myself. Because if I were to purchase a comic book without that seal and give it to Preston and MOTHER read it, I could be in real trouble. So thank you silent and shadowy organization, you will keep me safe from harm and a mother’s anger. Lets all do what they want and no one will get hurt. My arm is sore today. Kristina and I ended up rolling rounded weight to knock over pins for 4 ½ hours on Wednesday. I’m not sure, but I think that we bowled 10 games and consumed over 8 gallons of Yuengling. I woke up on Thursday and my right middle and ring fingers were swollen. There was a previously unknown leg muscle on my upper right thigh letting me know its displeasure with me making my way up and down the steps at work. Today, it’s my arm having a whack at getting special attention whenever it does something previously considered routine.